Bones® Swiss Labyrinth bearings feature a new shield that reduces drag and increases the overall speed of the bearing. The Bones® Swiss Labyrinth’s have a new redesigned inner race and two new labyrinth shields to keep the dirt out longer, but still allow easy maintenance when necessary. 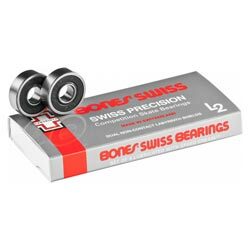 The only difference you will notice is that the Labyrinth Swiss will last several times longer than the original Bones® Swiss bearings between cleanings. This significant increase in service life comes at a very small increase in retail cost, so the value is greatly increased. great bearings I really don't like them any more than supper REDS. great for outdoor skating and maybe some cess slides in the rain. They don't break or stick if you maintain them. Can handle gaps and street sessions. fast, smooth and has longevity. I had some crap bearings for awhile. they are good bearings but i've gotten sick of the half shield on the back. i end up spending most of my time cleaning them. So my goal was to find a set of bearings that had full shields on both sides but were definitely some what higher end. So far i haven't had to clean the bearings yet and they roll great! quiet and smooth.